My beautiful babies are Jack, who was born on June 9, 2015 and Emmy, who was born on December 26, 2017. They were both born at Crosshouse Hospital in Kilmarnock, Scotland. Strangely they were both born at 23:48!! Spooky. When pregnant with my first baby I attended all the antenatal classes and read lots of books so felt I was fully prepared for labour. While I was a little apprehensive I was strangely intrigued about how I was going to cope. My labour started with my waters breaking in the middle of the night, followed soon after by my contractions starting. I did what had been recommended and got on my ball and tried to breathe through the contractions. As I was a first time mum I had nothing to compare the pain to and so perhaps started to get quite anxious about how painful they should be and what stage I was at. After about 2/3 hours we headed to the hospital, fully expecting to come home with a baby! However, on arrival I was examined and was only 1 cm, so with an induction booked for 2 days later I was sent home. I was devastated. I completely gave up and almost sulked. I sent my husband to work and I crawled in to bed with 2 paracetamol. I managed to sleep though my contractions for a few hours and then they seemed to shift. I wasn’t able to just let them happen. At this point I decided to get in a bath. I remember sitting on the toilet, watching the bath fill with water and not being able to get off the toilet to turn it off. My husband phoned to say he was on his way home... he found me in the bath. I still don’t know how I got in. This was my lowest point. I was in pain but just thought I couldn’t handle it. I hadn’t drank or eaten since the early hours and I was completely dejected. My husband tried to get me to eat but I just vomited. We called the hospital and were told to come back in. They eventually examined me and I was 4/5 centimetres so I was admitted. I was severely dehydrated so I was put on fluids and hooked up to the monitor. I managed to 6 centimetres before trying gas and air however this made me vomit which is not pleasant while contracting. I then opted for an epidural which did not leave me pain free but made my contractions manageable. Throughout the course of the next 3 hours I had meconium in my waters, baby’s oxygen levels had to be tested and I was put on antibiotics as my temperature was spiking. I eventually got to 10 centimetres and started pushing. After 30 minutes it was decided forceps were the best option. I was given an episiotomy and my baby was delivered. I will never forget the sensation of those forceps...an extremely unpleasant feeling but it got my baby boy here. My recovery was slow as I lost a lot of blood and was extremely exhausted but once admitted to the labour ward I always felt totally looked after and not at all concerned despite the worrying things that happened. That is down to the great staff at our local maternity unit. Only on reflection did I realise how traumatic things could have been. For me though, all I remember is holding my baby and watching my husband become a daddy. We had done it! My most recent birth experience was entirely different. I was induced due to reduced movements but was already 9 days overdue. The first pessary didn’t seem to do much however I had my second pessary at 7pm and delivered my baby girl at 11.48 pm. I was examined at around 11pm and I was 5/6 centimetres with the head still high so the plan was to walk to the labour ward to try and move baby's head. However when I stepped off the bed I was gripped by the all mighty urge to push/go to the toilet!! I then had to get back on the bed and was rushed to the labour ward. Everything happened very fast and it was almost like an out of body experience. I couldn’t quite believe that it was happening so quickly. Once I had a grip on the intensity of what was happening in my body I managed to gain some control and with the help of gas and air, my husband's arm and a few positional changes I delivered my little lady just before midnight on Boxing Day 2017. To feel my body perform such a magical feat was unreal. The urgency and power behind the fact that you just had to go with what your body was doing. Was absolutely amazing. No stitches and minimal blood loss meant I recovered quickly and we were home within 12 hours of baby being delivered. So I suppose what I want to convey is that both of my stories are incredibly special to me. 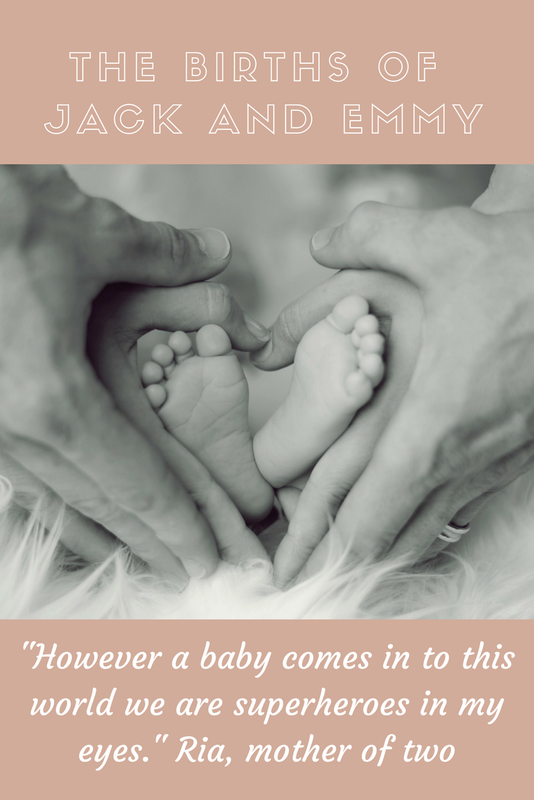 They were my journey to firstly becoming a mother for the first time and then almost a second chance to try and experience a birth with more control. I ensured I ate and drank all day during my induction and I was able to stay calm and breathe through the pain. I really felt proud of myself for that. And apart from the initial panic when I needed to push, I feel I did get my head back in the game quite quickly. However a baby comes in to this world we are superheroes in my eyes. Women do a beautiful thing. I would also like to acknowledge that my husband was an outstanding support both times and I honestly don’t think I could have done it without him beside me. The dads have a tough job too and my partner coped amazingly. I love my stories, they not only brought my babies in to the world but they showed me what I was capable of. Becoming a mother certainly gives you a serious case of perspective.